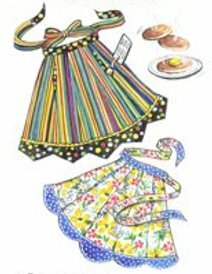 Quick and cute, very retro apron pattern. Comes either with curved hem or pointed contrasting hem. Hidden pockets done in contrast fabric also. Pattern includes 5 sizes, Ladies Sm - Lg, Child's & Doll's. by Paisley Pincushion.